Description: A trio of hi-nose Geeps come out of the yard and on to the layoff track at CP Bethlehem. Description: A trio of GP38-2s lead Linwood-Hickory train P61 up the hill at Five Row. Description: NS Power at rest on a Sunday afternoon. Description: A VERY rare sight for 2011; a trio of GP38-2's hurry #140 through Jenkinsburg, GA with a whopping 10 cars in tow. Description: Different trains at Old Spencer yard. Description: A small speeding Geep that caught me off guard, hence the crappy grab shot. 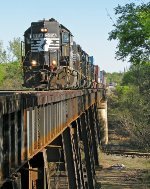 Description: March 21, 2014, Asheville, NC, 12:04pm: Yard job and local PA01 GP38-2 NS 5116 and MP15E NS 2356 pull three empty pellet hoppers past “A Lady on an Anchor”. PA01 has just finished working the Silverline Plastic Pipe plant on the old Craggy line and is now entering the west end of Norfolk Southern’s Asheville yard. Description: NS P95 rolls down the South Newton Lead, once the mighty Carolina & Northwestern. Were it not for the ditchlights on the locomotive, we wouldnt really be able to tell exactly what year it was! Description: Asheville, NC, Jan 17, 2016, 10:58am: NS 5116, EMD GP38-2, High short hood. 2,000 horse power. Built January, 1974. Former Southern Railroad SOU 5116. Description: NS 6109, 6094, 5116, and 3497 prepare to head out of Inman yard on July 11, 2017. Description: NS 6109, 6094, 5116, and 3497 head out of Inman yard on July 11, 2017.